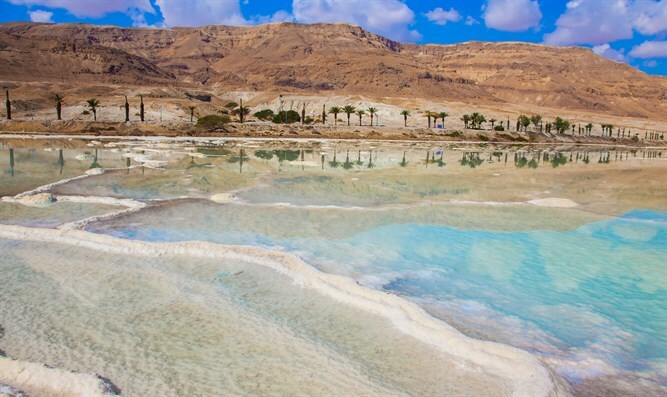 Jordan, Israel, may finally begin project to save Dead Sea from drying up. Israel and Jordan have long pursued a common goal to stop the Dead Sea from shrinking while slaking their shared thirst for drinking water with a pipeline from the Red Sea some 200 kilometers away. The degradation of the Dead Sea, on the border of Israel, Jordan and Judea and Samaria, began in the 1960s when water began to be heavily diverted from the Jordan River. "Since 1950, the amount flowing in the Jordan has dropped from 1.2 billion cubic meters per year (42 billion cubic feet) to less than 200 million," said Frederic Maurel, an engineering expert at the French development agency AFD. Heavy production of potash, used for making fertilizer, has also accelerated evaporation that has seen the sea's surface area shrink by a third since 1960. Experts say water levels are falling one meter (three feet) a year, and warn it could dry out completely within 30 years. Already 100 years ago, Theodor Herzl, the father of modern Zionism, had envisaged filling the Dead Sea via a canal dug to the Mediterranean. After years of studies, the $1.1 billion Red Sea "Peace Conduit" deal was signed by Israeli, Jordanian and Palestinian Authority in 2013. A subsequent 2015 deal would see Israel get 35 billion cubic meters of potable water from the desalination plant for its parched southern regions. The mostly desert Jordan, for its part, would get up to 50 billion cubic meters of freshwater from the Sea of Galilee. Israel also agreed to sell 32 billion cubic meters to the Palestinian Authority. Talks were frozen last year after a local Arab worker stabbed a security guard assigned to the Amman embassy, prompting a diplomatic standoff that ended only in January. Officials in Jordan say they are determined to press ahead with or without Israel to cope with the needs of a rising population which has been swelled by about one million refugees fleeing the war in neighboring Syria. "We are proceeding with the project because desalination eventually is the future of Jordan when it comes to water," said Jordanian Water Authority Secretary General Iyad Dahiyat.